I decided tonight that it was finally time to start posting to my “Kitchen Aid” corner. The next few posts will mostly be photo posts with a few comments. There is only so much you can say about baking with a Kitchen Aid…you put the ingredients in, mix it up, and bake. I just realized though, that recipes would be nice to add, so I’ll include those too. This might just turn into a kitchen corner!! -Who’s excited? One of the first things I made with our kitchen aid was my first loaf of bread. My friend, Kayla, showed me and I realized that it’s really not that hard. The key is to have quiet feet while the bread is baking. This keeps it from falling. I don’t know why, but fresh bread always seems to taste better than store bought. 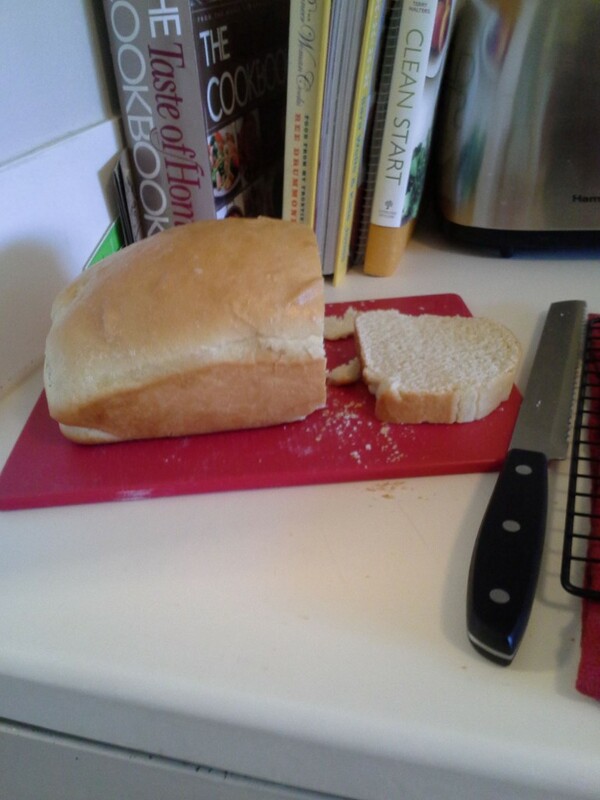 Easy Bread – By Kayla M.
Combine all ingredients in mixer. Mix until fully incorporated. Knead into desired shape. Place in greased bowl, with a damp towel over it to rise until double in size. When doubled in size, punch down the dough and knead out the bubbles. Shape into loaf and let it rise one more time until double in size. Place in a greased pan and bake for 30 min at 350 degrees farenheit.